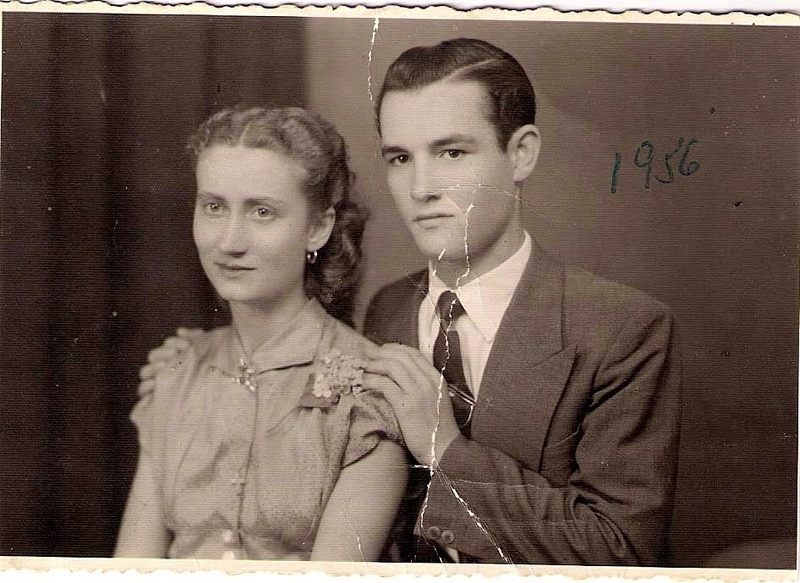 Oh wow, your grandparents were a gorgeous couple and your grandmother was insanely talented! No one in my family went any further than the usual basic clothesmaking and mending, but I got my drawing streak from my grandfather! I even have a landscape he drew on vacation in France, with a version done by five-year old me next to it. I'm sort of sad that he died when I was very young, and he never knew that I made drawing my job! Aaaw, this is so touching! I love the drawing memento you have from your grandfather (with you featured in it) and that you draw for a living. Lovely, thanks for sharing! That is such beautiful work, I'm not surprised she so modest, my mom was the same way. My mother did a lot of sewing for us as well as hand embroidery. After years of ignoring the fabric arts, I now have children of my own and have picked up the sewing & crocheting again, what a joy. Enjoy the visit and I love those photos! Thanks Diana, you enjoy your sewing and crocheting too! Gorgeous stitching and lovely old family photos, very romantic! I have one from the early 40s of my grandmother and her sister sitting on a car that I just love. It's so neat to see what one's grandparents were like when they were young. So true Andrea! We only get to meet our grandparents when they are older, so it's fascinating finding out about their younger selves! What fabulous photos and the embroidery is lovely. My Nan was incredible with cake decorating but sadly I did not inherit her talent for that. My mum worked as a machinist for ladybird clothing when she left school and regularly made us stuff as kids, but knitting is my mum's real forte! Oooh, I'd love to become a great knitter! oh doll this is so lovely :) I love reading about family history and yours is truly gorgeous. No wonder you've turned out to be such a nifty stitcher with this calibre of sewing in the family. Your grandparents look so happy. Thank you so much for sharing. Also feta crisps?! amaze! Thank you, I am indeed very lucky! So interesting, and such beautiful work. You are right to be so proud! Sewing was something that both of my grandmother's did extremely well. Knitting, crocheting and just about anything crafty was also on my father's side. My mom was a knitter and quilter. I've done most of the stitching. Your grandmother's work is beautiful. It is a shame that more people don't appreciate this type of work. Sounds like you've got a lot to live up to with all that talent in your family!!! Fantastic, thanks so much for sharing Angela! Wow that embroidery is exquisite. I would have never guessed it was done freehand. The crafty and textile gene skipped my mother, but her aunt, my great-aunt was a great seamstress. A depression era upbringing will do that to you, I guess. Luckily, I inherited a lot of her sewing supplies and patterns. It feels very special to be connected to family through hand crafts, no? Yes, it really does feel very special! I bet your inherited supplies are divine! That embroidery is amazing! Your family photos are great too - it must be wonderful finding out so much about your grandmothers hidden talents! My mum was an artist, mostly in textiles & did a lot of free hand embroidery which I remember her saying was really difficult. I'll need to share some more examples of her work soon. I love this post because I grew up in Cyprus and have quite a lot of embroidery that my mother collected as we travelled through various villages, and it is all stunning. I can't bear to use it so it sits in drawers, which now makes me feel a bit sad! My mother painted a lot and I have a couple of paintings of women sitting in the sun doing hand embroidery. However, I have nothing as beautiful as the bedding that you've shown. 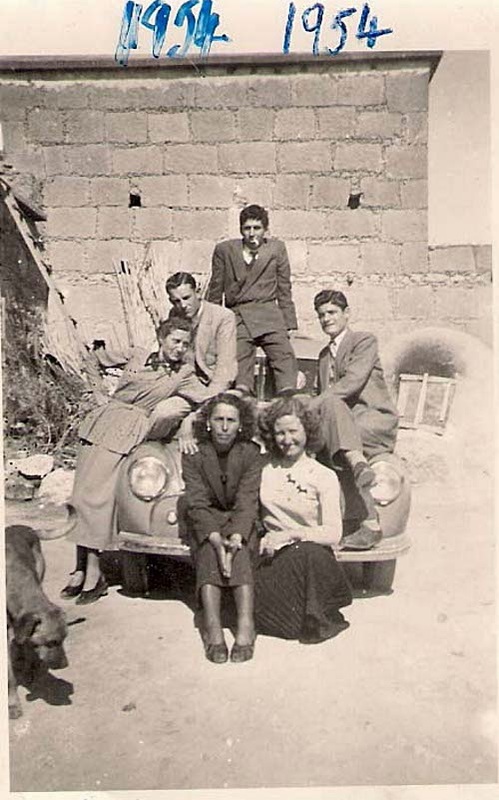 I love the photographs of your grandparents, what village were they from? Thank you so much for sharing! You really grew up in Cyprus!? Brilliant! Where about? My grandparents were from Leonarisoo...know of it? I'm sure your mother's paintings are lovely! Love this! Especially the old photographs. My grandmother was an excellent seamstress and sewed all her life until she couldn't see well anymore. I'd love to put some of her sewing story down on paper for posterity, like this. Thanks for sharing! Yes, definitely do...it's a lovely thing to share! Wow you have such a beautiful heritage! Not only did your grandmother have some mad skills and talent, but a handsome couple they were indeed! My grandmother was also an incredible seamstress (no hand embroidery though..) It is something to live up to and a family tradition that to keep alive! How lovely! It's wonderful how those items are still in use. What a talented woman. My Grandma sewed but I never realised until after she was gone. She made dresses and tenniswear etc and was part of a social sewing group at Church! So sad you didn't realise before, but it doesn't change the fact that she must have been very talented indeed! Love both the stitching and the story. I collect (and use!) hand embroidered pillowcases and these examples are truly lovely! Glad they're been appreciated Jeri, thanks! So pretty, I sometimes wish we learned embroidery and sewing skills as they did from generation to generation. Thanks for sharing especially the photos. Yes, that would have been great! Thanks for sharing your family's wonderful stitching history! Gosh, what amazing skill she has! That bedding is simply stunning. I wish I had the skill to do something like that. Thank you Helen, so do I! Wow, those notions from the 1900s must be incredible...how amazing to have trained to be a dressmaker back then! What gorgeous work and how lovely to know that you share a piece of history with such a remarkable woman. Thanks so much for sharing. Thanks Erin, lovely way of putting it! This is such a nice story! I don't have a similar thing in my family but my Mum was into sewing when I was younger and now as I have got into it she is getting back into it too, which I think is nice! I adore old photos; thank you so much for sharing. My grandparents lived in the same era, and I, too, have a special connection to my Nana who so patiently taught me to machine sew, embroider, and crochet. It was after her death that I went back to sewing because I miss her so, and feel closer to her when I practice these arts. One story I can tell about Nana is that she was very thrifty and often sewed our clothes well after the time she could afford satire bought. I have many happy memories of shopping in high end department stores "just to look" then running over to the fabric store to buy a pattern and material to recreate what we had seen. She was a master at it, and I grew up wearing many a faux designer dress. 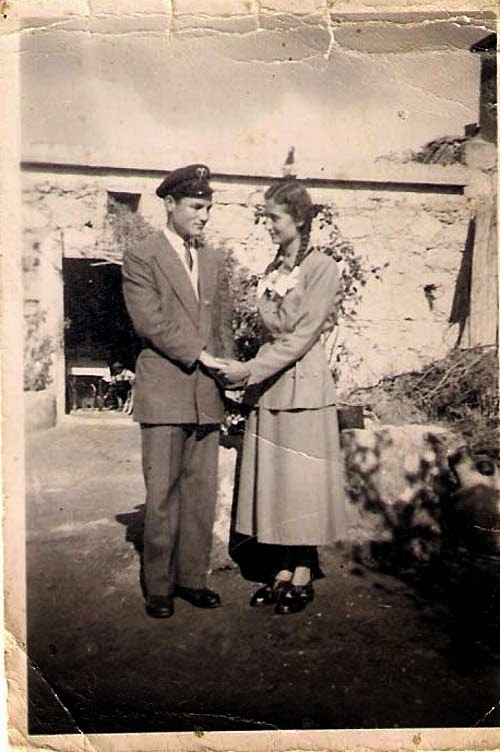 What gorgeous memories you have of your Nana, thanks so much for sharing. It's really touching! Wow beautiful work! What a talented lady! Beautiful photos! It's great to be able to connect with your grandmother through your shared craft. Her work is incredible! Very true words, thank you! Both the pictures and the linens are lovely - what a legacy! Your Yiayia's work is beautiful. My Yiayias did lots of cotton thread crotchet and I still have their bedspreads. Yiayiades are the best, aren't they?!? Your grandmother is truly talented! I'm amazed that the embroidery is all free-hand! It's perfectly executed. I've been fortunate to learn more about my own stitching heritage lately. It's really a treasure to have examples of the work your ancestors produced, and it's wonderful you have these stories to share! Thanks Michelle! I'm glad you've had the pleasure of finding out about your own stitching heritage too! What exquisite embroidery, your grandmother is super talented. Thank you for sharing your stories and lovely photos. Everyone always looks so smart in the olden days. Yes, people did take great care in their appearances in those days. And it's not like they weren't busy or didn't work hard! I don't know how they fit it all in! Your grandmother's work is beautiful. She reminds me of my Grandma who can sew and knit anything! Thank you for sharing the sweet photographs too. Haha, thanks Madalynne...you're too kind! A lovely post Marie and such beautiful embroidery, your Grandmother was very talented! My Gran taught me how to hand quilt and Mum taught me how to dress make..I made my first skirt 25 yrs ago and still sew with Mum. I love hearing of other families sewing past. You must be so proud! Lovely stuff Sam, thanks for sharing!